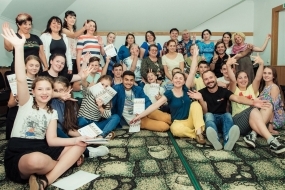 In July, Terre des hommes Moldova organized three rounds of training in the social theatre methodology for children. 40 pupils of different ethnicities, aged 13 - 18, from 20 communities across the country, participated in the workshops. Further, these young people will form social theatre groups in their schools and will set up performances to address the social problems faced by their communities. "The social theatre, like theatre in general, is a tool that shows people different issues from their community. We use theatre to show that there is discrimination, oppression, that there are issues that people do not notice or, on the contrary, they see them, but do nothing to change them. It is an instrument that brings to people, as a mirror, the realities of their community", explains Gabriela Teodorescu, briefly, the essence of social theatre. Gabriela Teodorescu, a certified trainer in social theatre, was invited from Bucharest to train the children in this methodology. She has passed with each group of children through the history, theory, notions and different forms of social theatre. Children have worked intensively for three days, combining practical exercises with theoretical notions. They learned what social theatre actually is, what are the differences among its forms, why would they need to use this tool and how social theatre could help them address social issues from their communities and to find viable solutions at the micro level, together with their colleagues and teachers, and at the macro level, along with members of the entire community, as a whole. Gabriela Teodorescu says that there have been some psychological barriers that children have experienced, which are natural that they have had to overcome. "For all of us, there a time when you have to go over some ideas that you have about yourself and what you are able to do, and I have to admit that I have provoked them quite enough to overcome these barriers." Social theatre can be practiced by anyone, from the age of 13 years old, "when the child has a certain level of maturity and can easily process the experience and extract the lessons from it", says Gabriela Teodorescu. In simpler cases, when the situation is not very serious or filled with negative energy, children from 11 to 12 years of age may also be involved. At the end of every training round, each group staged two social theatre plays and, with the help and the involvement of the public, they generated solutions for the addressed issues. The children took their inspiration from various situations from their communities and tackled issues such as harassment in school, bullying, social exclusion, oppression. Daniela, a 9th- grade student from Cainari-Vechi village (Soroca county), believes that "discrimination is everywhere - in school, in society, and we are the ones who can break the patterns." "I am myself a representative of a minority ethnicity, I am Bulgarian, and I believe that through social theatre we can destroy discrimination and show that all people are the same, regardless the ethnicity," says Alexandru, a 9th- grade student from the village Ursoaia (Cahul county). Although there have been three very demanding days, children were enthusiastic about the activities and the findings they have made. Alexandru liked that "a lot of deep, serious things, we discovered and approached them through the game method." We received an emotional message from Adelina, a pupil in the 8th grade from the village of Ciocâlteni (Orhei county): "I would like to thank you for the beautiful experience I have lived with your help. You made some children very happy! We felt very good, and we made new friends!" The pupils participating in the workshops have been delegated by their colleagues, two representatives per school, from each of the 20 participant communities. Starting this autumn, they will form social theatre groups in their schools and will set up performances to address the social problems faced by their communities, in order to bring them to public attention and to find solutions, and, thus, to stimulate the social change. Teodora Rebeja, manager of Child Protection and Migration Programme at Tdh Moldova, says that Tdh team support these children in the whole process: "We will help them to stage these plays in their communities. We will go with our colleagues to schools to help them select theatre groups and to direct the plays on the chosen topics." The training provided by Tdh in the social theatre is part of a large project that aims to combat discrimination against ethnic minorities from Moldova and to promote their rights. "We want, through the social theatre, for as many people as possible to know about the problems of their community, to experiment solutions, to find solutions from within and not to remain indifferent", Teodora Rebeja explains the purpose of the training and the stake in implementing social theatre programs in schools. Gabriela Teodorescu believes that "social theatre is suitable to use where there are problems, and I think there is, in fact, no place without problems. There may be some more serious and others less critical, but the range of issues that can be addressed is so broad that it is a good idea to have someone who can use this method in a school." See more photo on the Facebook page of Tdh Moldova: group I, group II, group III. Tdh Moldova Foundation implements the project "Sustainable community partnerships to support the rights of persons belonging to ethnic minorities in Moldova" in partnership with the Institute for Rural Initiatives, with the support of the Ministry of Education, Culture and Research of Republic of Moldova and with the financial support of the European Union, EU covering 95% of the project’s costs. The project is carried out in 20 multi-ethnic communities across the country, between December 2017 and January 2020.